Can distributed storage make EV chargers more valuable to hosts? The energy storage startup Green Charge Networks joined forces with NRG eVgo today to deploy electric-vehicle charging stations with integrated batteries -- a move that could give Green Charge a new market as competition in the distributed energy storage space intensifies. Green Charge has already deployed its customer-sited GreenStation energy storage systems at commercial businesses, cities and schools across the country. Using lithium-ion batteries, the software-driven platform allows end users to reduce consumption and avoid high demand charges during peak times. In California and New York in particular, rates can skyrocket during midday periods of high demand. At the same time, customer loads don’t remain constant: for example, elevators sit idle between trips and boardroom lights are switched off after meetings. Distributed storage is designed to offset this volatility and help lower utility bills. Taking a page out of the solar industry’s book, Green Charge uses a no-money-down financing model, also known as a power efficiency agreement (PEA), which takes financial pressure off the end user. Green Charge installs, owns and operates all of the assets it deploys at no upfront cost to the customer. The two parties then split the resulting savings and revenue generation over the course of ten years. The company has already deployed projects at 7-Eleven stores, Walgreens drugstores and a UPS distribution facility. But why partner with electric vehicle (EV) charging stations? To support the growing number of EV drivers, eVgo is building out a network of more than 200 Freedom Stations. These fast-charging sites can conveniently charge an EV such as the Nissan Leaf from zero to 80 percent in less than half an hour, but charging at that rate creates a power spike that significantly increases the host customer’s demand. The GreenStation system will help to mitigate those peaks. Meanwhile, the two companies can pool their efforts in targeting potential clients and will benefit from shared power electronics, interconnection and construction costs. The battery storage is not hooked up to the EV chargers, however. Rather, it’s attached to the building load. The two appliances exist in parallel and join up at the host’s electrical panel. The financial analysis for the system is based on the customer’s baseline energy usage over the past twelve months, said Shao. As EV sales grow, demand for the chargers will likely increase, making the system more economically beneficial. At the same time, the economics don’t rely on massive consumer adoption of EVs, which are still only trickling onto the road. Green Charge and NRG have been testing their joint system for several years at select 7-Eleven locations. Today, there are five joint NRG-Green Charge sites in California deployed at schools, San Francisco’s Levi’s Stadium and a couple of 7-Eleven stores. According to Shao, the system has been shown to offer savings of up to 50 percent during peak summertime hours. The PEA model makes it very much in Green Charge’s interest to ensure that every system it deploys sees significant savings, he added. 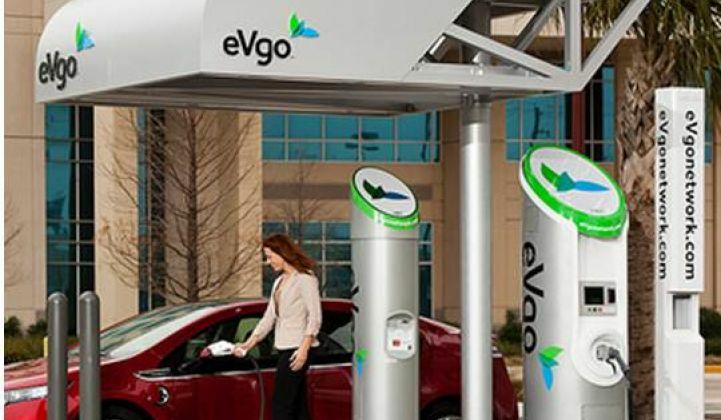 The eVgo partnership is the latest development in what’s already been a busy year for Green Charge. 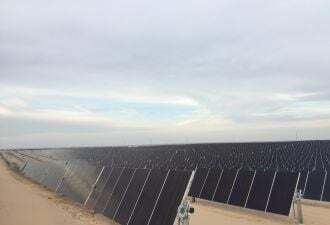 After taking some time to refine its product, the company came back onto the scene earlier this year with new project agreements amounting to 1.1 megawatts in cumulative capacity. In February, Green Charge and partner TIP Capital announced a $10 million fund to support new projects. Then, in July, Green Charge Networks brought in $56 million from K Road DG to expand its energy storage program; the company claimed this was “the largest amount of capital raised by any company in the intelligent energy storage space" at the time. Now, the startup is laser-focused on getting to scale. According to Shao, the sales pipeline has already doubled in the two months since the funding announcement. Last week, the company announced a strategic supply agreement with leading battery manufacturer Samsung SDI to deliver as much as 25 megawatt-hours' worth of lithium-ion batteries over the next two years. The agreement ensures Green Charge an adequate supply of batteries as it seeks to drive commercialization of intelligent energy storage. Green Charge certainly isn't alone in the early race to deploy distributed storage. Plenty of other companies in the storage space, including Stem, Sonnenbatterie, Geli and SolarCity/Tesla, are vying to become big names in the market. To date, SolarCity’s solar business is focused on the residential and commercial solar market, but with a built-in installation business and relationship with Tesla, it could come out strong in the commercial storage sector. Shao said he thinks the successful companies will be those that venture outside of the Silicon Valley ecosystem and connect with more broadly focused traditional players like Samsung or NRG.